As news breaks of the capture of over 150 more Christians – this time from a northeast Syrian town – the gruesome beheadings of 21 young Egyptian Christians in Libya has presented an opportunity for the Gospel in Egypt, where Christians and Muslims alike are united in grief over the slaughter of their countrymen. Last Sunday evening, after an ISIS-backed group released its horrific propaganda video, Ramez Atallah of Bible Society Egypt swung into action to ensure that a scripture tract with encouraging verses was ready to distribute to the nation as soon as possible. Less than 36 hours later, a tract called Two Rows by the Sea was sent to the printer, who worked all night to get the job done. Over 1.6 million copies have been distributed to Egypt’s churches in the local Bible Society’s biggest ever campaign. 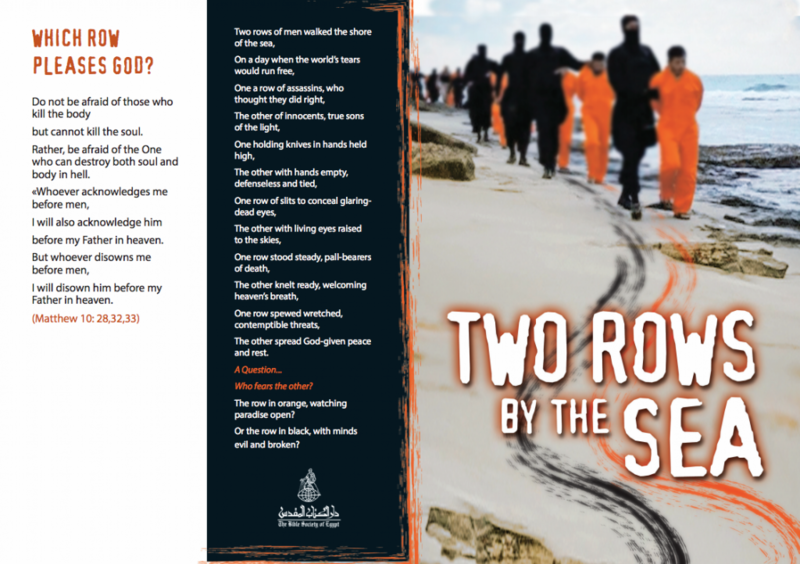 The tract contains inspiring and comforting quotations from the Bible about the promise of blessing amid suffering, along with a poem that poignantly contrasts the attitudes of the row of men in orange jumpsuits and the row of black-clad, masked executioners. Amid the unprecedented openness to the Gospel, one downtown Cairo church has taken the opportunity to hang a poster on its wall where pedestrians can see it – an Egyptian flag overprinted with “We learn from what the Messiah has said: ‘Love your enemies, do good to those who hate you’.” Pastor Francis Fahim of the Isaaf Evangelical Church said the poster was meant to express comfort to all Egyptians, Muslim and Christian, according to Christianity Today. Egypt’s 10 million Christians and 73 million Muslims have been united as never before since the release of the gruesome video, Atallah says. Rather than provoking sectarian strife, as ISIS intended, the video prompted a loving and caring response among Muslims across the board, which helped to soften the blow for many Christians, who have responded with sorrowful restraint. A Bible Society Egypt co-worker told Atallah the encouragement she received from the example of the 21 martyred Egyptian Christians. “When I saw these young men praying as they were being prepared for execution and then many of them shouting “O Lord Jesus” as their throats were being slit, I realised that the Gospel message can still help us to hold on to the promises of God even when facing death!” she said. Egyptian state media reports that almost 15,000 Egyptians have fled Libya since the murders. Cairo has chartered planes to fly many of them home from Tunisia, Libya’s neighbour. It is unclear how many of them are Christians. Here is the full poem. Download the full Bible Society Egypt tract, in English, here.